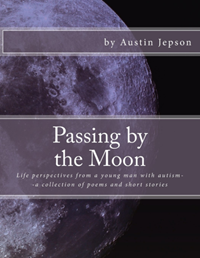 I am announcing that my first book of poetry and short stories is now available on Amazon. I am really proud of it and love how it turned out. It is pretty awesome to see my name on the cover and to know that my words will now be immortalized. Thanks, Mom and Dad, for helping me to achieve this goal. I hope that lots of people will buy it and that they will understand that just because someone can’t speak out loud, it doesn’t keep them from saying important things.